A screenshot that successfully tells the player what to expect from the game–notice the load hasn’t completed. Thanks for reading! If you enjoyed that free sample paragraph, you can continue this article by sending $1.99 to my Paypal account to unlock the next sentence! This month only, you can buy the entire next paragraph for 25% off! And if that didn’t clue you in, the game flopped like a trout sunbathing on a stone slab. Yes, the game garnered high scores and praise from critics and spread itself like a plague to the rabid 25 Million rabid PvZ enthusiasts who downloaded the game without a trace of realization that film directors have used zombies for years to criticize mass consumerism. Yes, it designed new worlds with clever themes for their zombie attackers. And yes, it gave us brand-new plants and let us unlock costumes to make them look cuter. But when most of the features hide behind the checkout counter of the online store, the game basically amounts to playing a commercial, and even with all the optional purchases you couldn’t tempt viewers with such a threadbare ad if you played it during the Superbowl. In fact, I only felt inspired to make a single purchase during the entire game; the HD version of the original. (The DS version had a tendency to seize up when the player blankets the entire field with Cob Cannons) The DVD rack in my living room will testify to my willingness to shell out as much as $60 for a game, but I would rather pay more for a complete game than a pittance of coins to buy parts in installments. Naturally though, if they thought they could have made more money with a single up-front cost, they would have sold it that way. Rather, PvZ2 inundates you with an avalanche of tiny purchases that EA hopes no one will tally up to realize how much money they’ve actually vaporized playing the game. 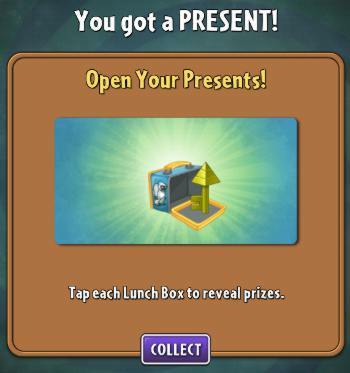 Yetis drop lunchboxes with prizes. Don’t expect to get this, though; they deleted keys from the game. Furthermore, taking a page from Microsoft’s book, they haven’t even completed the game yet. 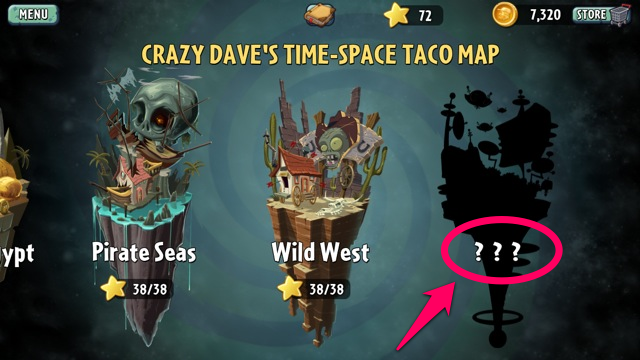 One world, as of the time of this writing, still remains blacked out with question marks enticing us to keep us playing indefinitely, so they can dangle their unlockables in front of us like the light on an angler fish’s head. To add to this, every few days they’ll offer a “yeti event” or a “party,” a bonus level that lets you…kill a robotic yeti or play a specialized mini-game level, which I’ll admit had me running to the game every night until I realized that this offered virtually nothing except a handful of in-game cash too meager to use for anything because they’d rather sell you in-game cash in exchange for your real cash. Fair trade, right? Think of it like buying a gift certificate, only less useful. 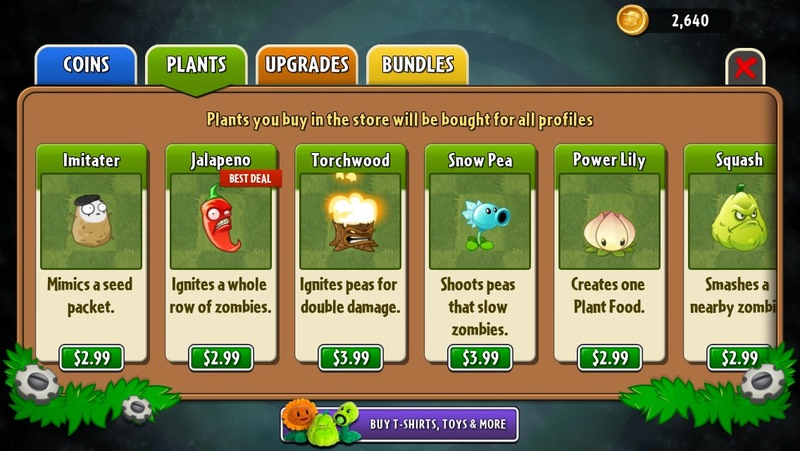 While the shop in the first game had interesting items that added to all aspects of game play, money in PvZ2 will only buy you Deus-ex-Machina attacks, which don’t fall in the category of “useful tools” since you can finish every (existing) level with just the (free) plants. The map offers players branching paths that let them decide what order to unlock prizes. Don’t expect to see this; they removed it from the game. 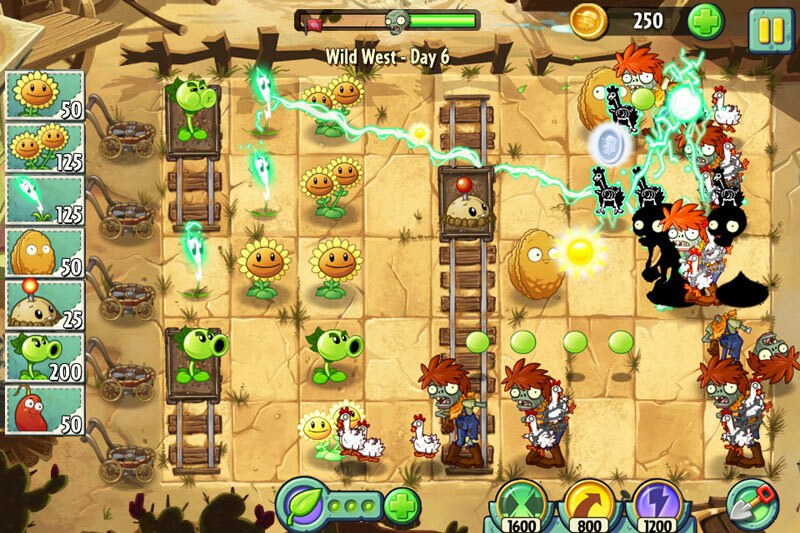 To add to the frustration of not having a completed game, PvZ2 underwent a massive redesign about a month ago. Formerly a map with branching paths that could be unlocked by keys randomly found (but more often purchased) by completing challenges, they opted to make it linear, offering angry players a handful of in-game cash to sooth the anger welling up over the fact that some of us played the game for weeks trying to build up those damn keys! The redesign also added the gigantuar mini-bosses from the original, but even with the addition, the variety of zombies, attack patterns, and–even with all the purchasable items the number of plants. Also, don’t look for mushrooms, night levels, roof levels, aquatic plants, or a Zen garden. 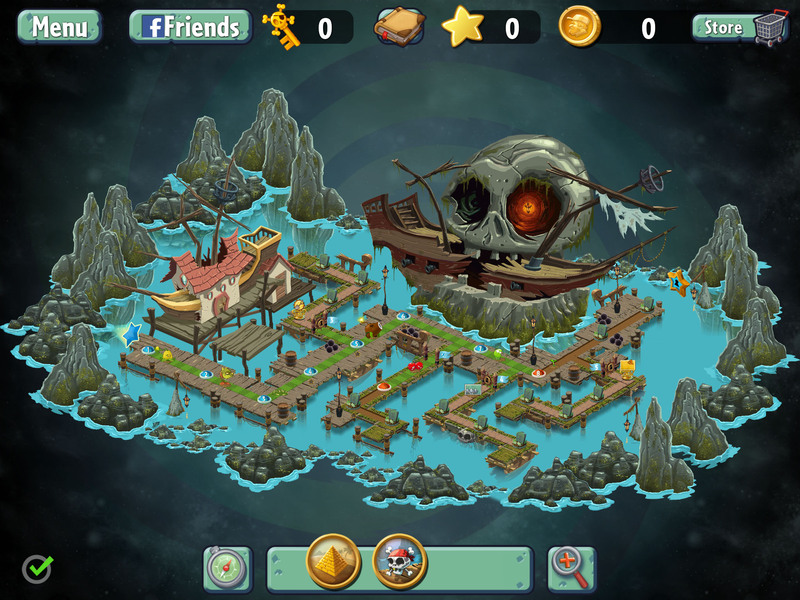 The mini-games have also lost variety and almost entirely resemble the main game, as well. Factor in the change from branching paths to a linear progression, and one may suspect the game designers visualize us as helpless dolts, fearful of having to make the slightest decision without consulting our life coach or dialing up our psychic friend or pulling de-contextualized phrases out of the Bible like we’d read the phone book and interpreting them as literally as possible. Sorry, but even the simplest of minds enjoys making their own decisions once in a while, but when you strip those decisions down to which handful of plants you’ll use each level, the game becomes boring very quickly. Recognizing the fact that I don’t always describe very well the games I write about, I suppose you may appreciate a run down of the game to figure out what I’ve yammered on about for the last three pages. Tower defense. Zombies come at you. Five rows of them. Plants based off clever puns. Pea shooters, iceberg lettuce, bonk choy. Zombies eat plants; zombies eat your brains. There. Does that help? The game doesn’t exactly thrive on complexity. The original did very well not because it reinvented the tower defense genre, but because they put a lot of care into the elements of the game, easily giving us a variety of problems, decisions, strategies, etc that forced us to adapt level-by-level. The game offered amusingly misspelled notes left by zombies who offered very thin facades to coax us into opening our doors to them (one note even bearing the signature “mom (not the zombies)”). Plants vs Zombies 2 replaces the variety of elements with a variety of sales pitches, and rather than genuinely humorous interludes, we get your neighbor, Crazy Dave, searching through time to find a taco he ate at the beginning of the game; this seems to attempt Stupid Humor (think “Napoleon Dynamite”), and while a lot of people seem to enjoy Stupid Humor, the returning fans will miss the Clever Wit of the original, while the taco quest becomes the same joke repeated indefinitely. Literally indefinitely–we have no idea when they’ll release the next world of the game. Plants vs Zombies 2 doesn’t qualify as retro, I know, but I thought I should drop in a reminder about why we should play more retro games. As game developers lean more and more toward terrible ideas, gamers need a refuge where they can play something fun. So ignore the positive reviews. PvZ2 loses its charm very quickly, while the original will hold your attention like Fallout 3 on Ritalin. Buy that one instead. 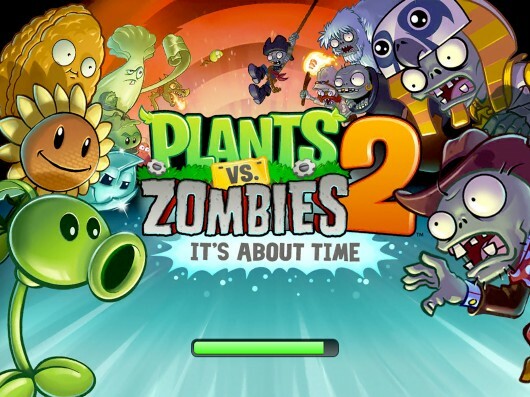 Update (July 7, 2014): PvZ has, by now, released two new worlds for this game. However, by this point, I have long since stopped caring.